Among the artists that actually made a difference last year, Kidult is on top of our sparks for your life list. Defending the very own and simple nature of street art from its commercial use by corporates and brand, Kidult has not only pissed off some of the biggest such us Hermés, Supreme, Kenzi, YSL ,Agnés b., Colette and a few more, but has also made a valid and clear point. 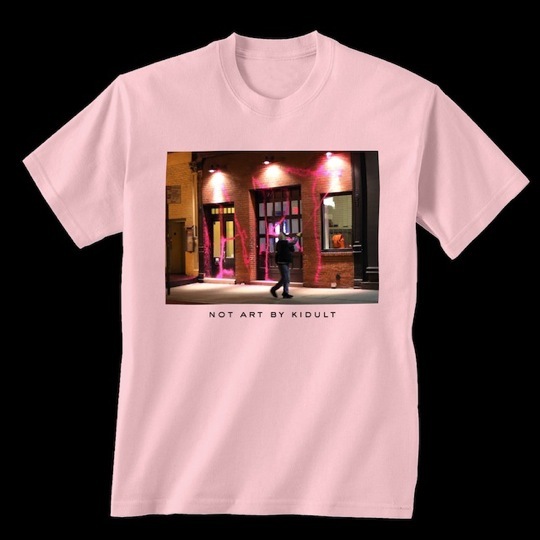 The smartest move from the “dark side” so far has been from Marc Jacobs (whom we love as well) whom shortly after being visited by Kidult, has taken pitcures of the result, releasing it as a $698 limited edition T-Shirt with Not Art by Kidult written under the picture. Graphic t-shirt designer FRY created a $35 t-shirt printed with a picture of the Art by Art Jacobs t-shirt, which is printed with the graffiti’d storefront. Now, something is happening, something is moving, and it was about time, so hoping that we can help as much as possible Kidult into shaking a little the world of fashion, to inspire both new art and true art, we so far smile and clap our hands. Do u ?